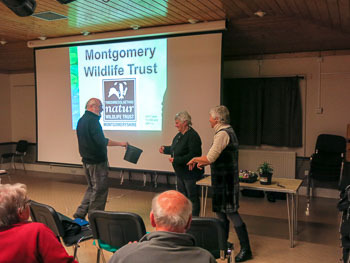 In a change to the published programme, one of our members Sue Bosson, came at short notice to give a presentation on A Day in the Life of a Wild Life Trust Volunteer. Sue volunteers usually one day a week on a Wednesday (“it hardly ever rains on Wednesdays”) for the Montgomery Wild Life Trust. Sue gave us an insight into the varied type of work involved, from cutting down willows to bridge building and from clearing thistles to allow flower meadows to re-generate, to dry stone walling. The sessions are well supervised by a qualified leader and where necessary safety and skills training is given. Sue emphasised the team working aspect of the jobs, with a diverse band of people, from many walks of life. Her slides, showed that it wasn’t all work, with the volunteers relaxing at meal times and chatting to one another, and enjoying the beautiful views into the distant countryside. 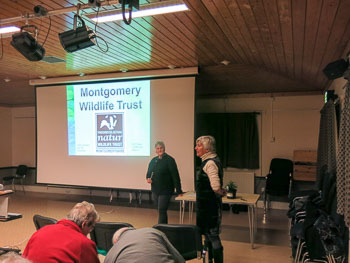 The session was interactive with many comments and queries coming from the floor and with additional information on wild life in general shared between Sue and members of the club. This was appreciated by the members and contributed to a relaxing and enjoyable, which as usual finished with the drawing of the raffle and a cup of tea or coffee and a biscuit and time to chat with friends. Sue was thanked both for standing in at the last minute and for her informative talk. Hopefully it will spur some members on to consider being a Wild Life Trust volunteer in the future.